At Wiser Recovery Jewelry, we offer a large selection of handcrafted recovery jewelry—rings, toe rings, pendants, necklaces, pins, earrings, key chains, money clips, novelty items and lighter cases—to help you celebrate your recovery! 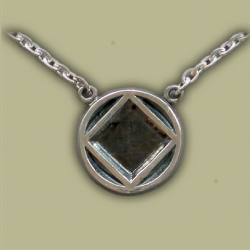 One of our NA or AA Jewelry items make the perfect spiritual gift for sponsor or sponsee. All items (except chains) are made right here in our home studio. Our recovery jewelry is offered in sterling silver or 14 karat yellow gold, and enameling is available on select items. New items will be added as they are developed. Our recovery jewelry is unconditionally guaranteed. If you are not satisfied with your purchase, return it within thirty days for repair, replacement or refund. Items can be shipped worldwide. All prices are in US dollars. Requests for customized pieces will be considered. We welcome wholesale inquiries from 12-Step and recovery gift shops as well as recovery clubs. Please contact us if you have any questions about our AA and NA jewelry. Wiser Recovery Jewelry offers some of the finest NA and AA jewelry and 12 step novelty items to be found anywhere. We are available to serve as a NA jewelry vendor at any Narcotics Anonymous convention or function. Contact us to service your Narcotics Anonymous convention, NA region or NA area. 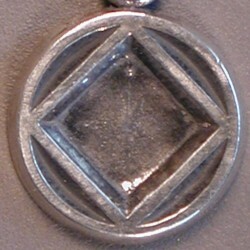 * All images are property of Wiser Recovery Jewelry and are to be used by permission only.